Iximche is very important in the history of modern Central America. It’s not as well- known as the major archaeological sites of the Classic Period (250 to 900 AD) and the majority of visitors are indigenous Maya people. The remaining structures are palaces, ball courts, a ceremonial area and temples. There is also a museum that contains sculptures, ceramics and other pieces found during the excavation and restoration. We were lucky to witness 2 sacred fire ceremonies next to an ‘altar’. 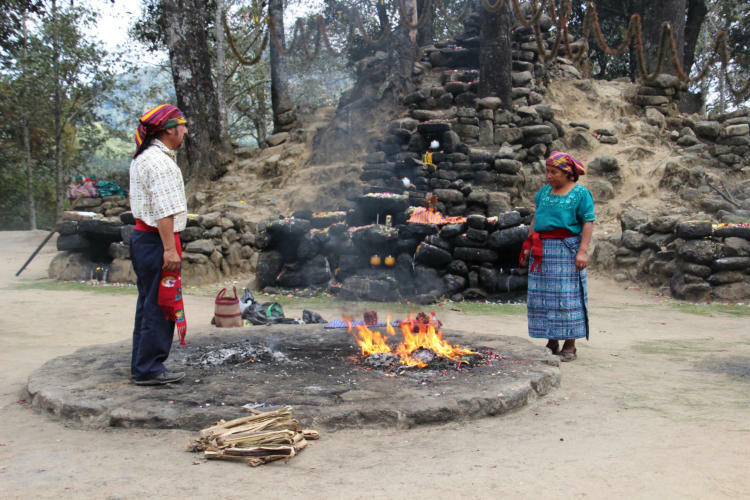 Descendants of the Kaqchikel visit the site with a Shaman (Priest) who performs a sacred fire ceremony for them. The participants guide the intent and purpose of the ritual, asking for such things as healing, protection, safe travels, cleansing of bad energy, or insight into challenges in their lives. Mayan fire ceremonies don’t use any wood. With prayers, a mandala is created. First, sugar is used to draw the circle, and then ensarte (made from parts of trees dipped in resin) are placed on top of the sugar to create the spiritual foundation for the sacred fire. Then, herbs and flower petals are placed in abundance on top of the ensarte. The other main components of the fire are candles in the colors of the six directions (red, black, white, yellow, blue, and green). Typically, 13 to 20 candles (8” tapers) of each color are used in each ceremony. Chocolate, cinnamon and honey are also put into the mandala to bring sweetness and give thanks for the blessings in our lives. Iximche was founded by the Kaqchikel Maya in 1470 after a prolonged conflict with the Kiche Maya forced them to abandon their previous capital Chaviar (present-day Chichicastenango). The new capital did well in its first decades, but was severely damaged by a fire in 1514. In 1519-20 a major epidemic struck Iximche, killing many inhabitants and prompting many others to flee to the countryside. The weakened Kaqchikel welcomed the Spanish conquerers under Pedro de Alvarado with open arms when they arrived in April of 1524 and allowed them to found their own capital nearby. However, the relationship with the Spanish, who at first promised to be a valuable ally against their long-time enemies, the Kiche, soon deteriorated. The conquerers' incessant demands for gold and the inability of the Kaqchikel to provide it in sufficient quantity quickly led to hostilities that culminated in several Spanish attacks on Iximche. In September that year the Kaqchikel abandoned their capital and took to the surrounding mountains, from where they waged a guerrilla war against the Spanish. The conquerers burned Iximche to the ground in 1526 and were able to defend their own capital for a while, but the raids took their toll. In 1527 the Spanish abandoned their first capital and founded a new one in the Almolonga valley (present-day Ciudad Vieja near Antigua Guatemala). Iximche was re discovered in the 17th century by an explorer, but formal excavations and studies about the abandoned Mayan City didn’t start until the 1940s. Iximche was a hiding place for the guerrillas during the mid 1900s. A ball court - The ancient Maya ballgame called pitz was part of Maya political, religious, and social life. Players would attempt to bounce a rubber ball without using their hands through stone hoops attached to the sides of the ball court. The hoops were very high so it was difficult. The winners of the game were treated as heroes and given a great feast. The penalty for losing a game was sometimes unusually harsh: death.